Yesterday afternoon NewBay Media presented trophies to the winners of the 2014 System Contractor NewsInstallation Product Awards at InfoComm. Despite the microphone ironically malfunctioning at an event chock full of audio visual pros, the show continued, bigger and better than last year (see: standing room only). SCN editor Chuck Ansbacher presenting the award for Most Innovative Audio Hardware: Loudspeaker to Stealth Acoustics StingRay's president Paul Hagman and vice president Steve Olszewski. 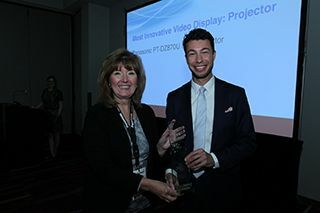 Panasonic's Cynthia Pawlowski accepting the award for Most Innovative Video Display: Projector. CEO Rob Sheeley and marketing manager Hailey Klein took home the Most Innovative Collaboration Product: Hardware award for Vaddio GroupSTATION.